Here's an updated, clearer picture of the new tiara. (I'm still trying to decide if I like it. I think it's maybe too small? Please register your feelings below.) She also wore delicate diamond earrings. Queen Silvia wore her best blue gemstones for the wedding of her only son: the tiara, earrings, and brooch from the Leuchtenberg Sapphire Parure. She also wore a diamond riviere with a pendant drop, plus diamond bracelets, the Order of the Seraphim, and her husband's family order. One of my favorite jewel moments of the day was Crown Princess Victoria's very first appearance in the Connaught Diamond Tiara, a century-old heirloom from the Swedish vaults. Victoria also wore diamond and pearl earrings, a diamond and pearl brooch, the Order of the Seraphim, and her father's family order. No jewels yet for Princess Estelle, but she was a very cute part of the wedding party. Princess Madeleine wore her own wedding tiara, her mother's Modern Fringe, to her brother's wedding. She also wore her wedding earrings, the family's heirloom Vasa earrings. She secured the sash of the Order of the Seraphim with a small diamond bow brooch from the Bernadotte collection, and she also wore her father's family order. Princess Margaretha wore the Aquamarine Kokoshnik to the wedding, but there aren't any decent pictures available for me to use yet. (Ditto Princess Desiree, who wore the larger of the Napoleonic Cut-Steel Tiaras.) Princess Birgitta wore the Baden Fringe Tiara. Here's a good look at all four of the Haga Princesses. UPDATE: Here's a great picture of the four Haga Princesses! The king's youngest sister, Princess Christina, wore the family's Diamond Six-Button Tiara with pearl and diamond jewelry, plus the Order of the Seraphim and her brother's family order. Princess Desiree of Hohenzollern wore the Pearl Circle Tiara that once belonged to her mother, Princess Birgitta. Countess Marianne Bernadotte of Wisborg, the widow of the king's uncle, Count Sigvard, wore a diamond tiara with diamond and pearl jewelry. Countess Bettina Bernadotte of Wisborg, daughter of the late Count Lennart and Countess Sonja, wore a small diamond tiara. 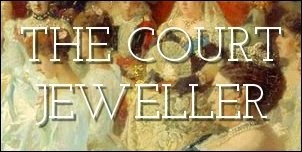 Stay tuned later today for the jewels worn by foreign royal guests!